Panama, Costa Rica, Nicaragua, El Salvador, Honduras, Guatemala, Belize, southern Mexico and parts of Cuba and Jamaica are all seen in this image from NASA's Shuttle Radar Topography Mission. 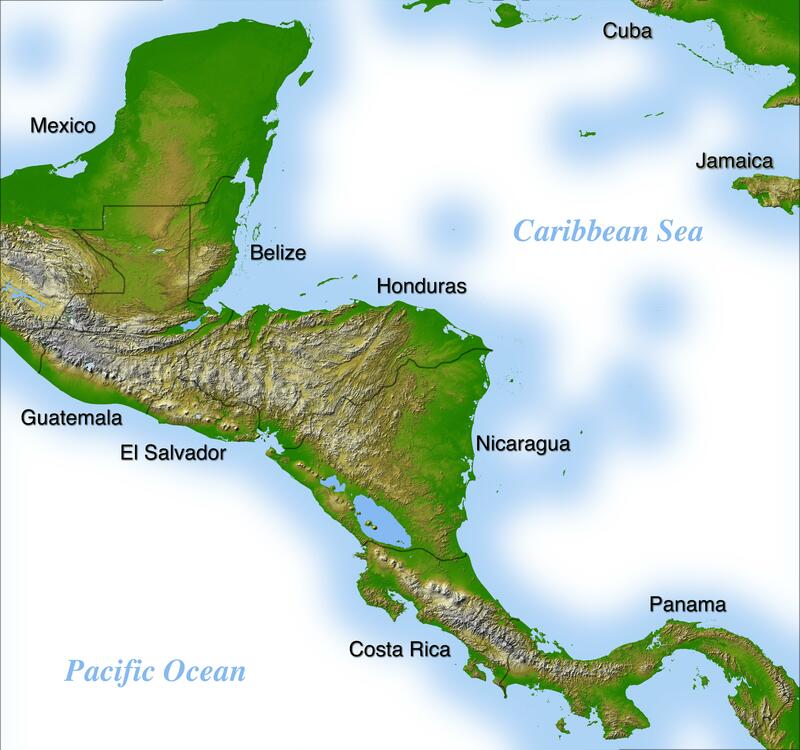 The dominant feature of the northern part of Central America is the Sierra Madre Range, spreading east from Mexico between the narrow Pacific coastal plain and the limestone lowland of the Yucatan Peninsula. Parallel hill ranges sweep across Honduras and extend south, past the Caribbean Mosquito Coast to lakes Managua and Nicaragua. The Cordillera Central rises to the south, gradually descending to Lake Gatun and the Isthmus of Panama. A highly active volcanic belt runs along the Pacific seaboard from Mexico to Costa Rica. High-quality satellite imagery of Central America has, until now, been difficult to obtain due to persistent cloud cover in this region of the world. The ability of SRTM to penetrate clouds and make three-dimensional measurements has allowed the generation of the first complete high-resolution topographic map of the entire region. This map was used to generate the image. Two visualization methods were combined to produce the image: shading and color coding of topographic height. The shade image was derived by computing topographic slope in the north-south direction. Color coding is directly related to topographic height, with green at the lower elevations, rising through yellow, red, and magenta, to white at the highest elevations. Elevation data used in this image were acquired by the Shuttle Radar Topography Mission aboard the Space Shuttle Endeavour, launched on February 11, 2000. The mission used the same radar instrument that comprised the Spaceborne Imaging Radar-C/X-Band Synthetic Aperture Radar that flew twice on the Space Shuttle Endeavour in 1994. The Shuttle Radar Topography Mission was designed to collect three-dimensional measurements of the Earth's surface. To collect the 3-D data, engineers added a 60-meter (200-foot)-long mast, installed additional C-band and X-band antennas, and improved tracking and navigation devices. The mission is a cooperative project between NASA, the National Imagery and Mapping Agency of the U.S. Department of Defense, and the German and Italian space agencies. It is managed by NASA's Jet Propulsion Laboratory, Pasadena, Calif., for NASA's Earth Science Enterprise, Washington, D.C.